What does the expression derma roller mean? What kind of cosmetic treatments can be done by using derma roller? Treatments with derma roller (needle roller) are called collagen induction therapy. Various cosmetic, aesthetic interventions can be performed with derma roller both on face and on other parts of the body. The needles are made of surgical steel. Microlesions caused by the needles stimulate the body’s self-healing mechanism, which increases the collagen production. Due to this the skin gets younger. What is the difference between needle mesotherapy and derma roller? How can you decide which treatment you need? At the first hearing this treatment seems to be very similar to the needle mesotherapy / mesolift treatment. The most marked difference between mesolift and derma roller treatment is that mesolift treatment is carried out by a highly qualified expert who uses guided technique and different needle depths, ingests active substances into the skin. 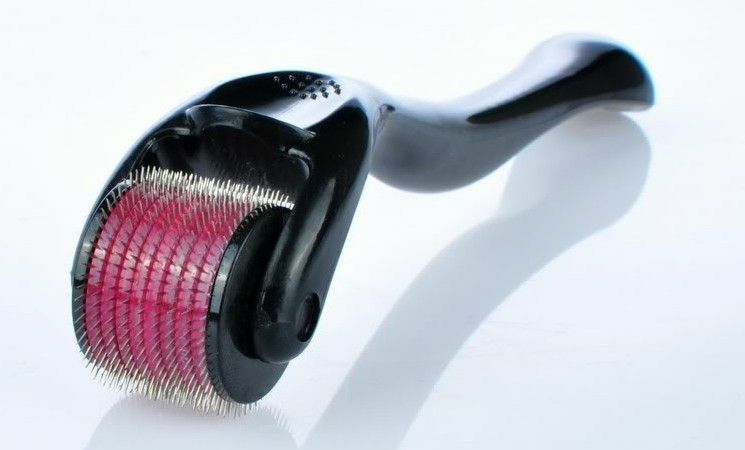 In case of derma roller many people think this tool is a simple roller that can be bought for nothing for example as an attachment of a newspaper and it can be used for cosmetic treatment at home. But it’s not the right approach. The first and most important step of derma roller treatment is to choose the most proper needle roller having the ideal depth for your skin. The next step is roller using as – it is mostly not known – the derma roller treatment makes the skin dry in itself, therefore continuous use makes the skin dehydrated. To understand why, you must know the action mechanism of the treatment. As a result of the multiple pin-pricks intense collagen and elastin fiber synthesis starts up in the skin. This is why derma roller is an anti-aging treatment because it slows down or postpone the aging of the skin. As the treatment may cause superficial bleeding, it’s not recommended to do this treatment at home since the lack of proper hygiene increases the risk of infection. Derma roller treatment is an effective way to ingest the sterile, skin care active agents to the bottom layer of the skin both in the needleless mesotherapy and in the vitalaser treatment. Derma roller treatment isn’t enough in itself because skin gets dehydrated, the result fails to come. But if it’s applied for skin prepartion, it works wonders. In case of acne, scarred skin or stretch marks derma roller is indispensable because in this cases died tissues must be vivified and it’s impossible without pin-pricks. We still often wonder about its efficiency while making 20-year-old stretch marks or surgical scars disappear. Our customers have their own, registered derma roller in our salon. Customers have to buy the derma roller only once, after that we can use it during those treatments where it increases the treatment’s efficiency. How many treatmenst are usually needed? It depends on the given aesthetic problem, after the first treatment our experts can let you know how many treatmenst you need to solve the problem. During the treatment our experts can see how actively the customer’s skin responds to the treatment and the active substances. After derma roller treatment mild redness, minimal peeling may occur. Treatment can be carried out also in summer, but it’s necessary to use sun protection cream of proper factor and quality. After derma roller treatment redness similar to sunburn may appear that usually vanishes completely in 1-3 days depending on the skin’s regenerative capacity. In case of extremely sensitive skin minor bruises may also appear that last 1-2 days. After collagen treatment it’s important to avoid strong sunlight for 6-8 weeks. Skin must be protected after the treatment with sun protection cream of at least 20 SPF, sunbathing and tanning are not recommended. active skin infection, acne, eczema, etc. Which is better? 540 needle derma roller or 200 needle derma roller? This question arises rightfully, but opinions vary even in international relations. It speaks in 540 needle derma roller's favour that the treatment lasts shorter. - it must be pressed too strong, that is not advantageous because of the thin skin. One thing remains certain that 192-200 needle derma rollers are more widespread internationally. However 540 needle derma rollers that were much more expensive earlier cost just as much as the 200 needle derma rollers. There are many people who like 540 needle rollers because they don't find the treatment so painful. The reason is that the needles don’t penetrate to the proper depth. It has a simple physical explanation, think of the fakir effect. If a fakir lies on many nails, they don’t pass through his skin, but if he tried to lie on a single nail, it would pierce his body. If a 540 needle derma roller is pressed on the skin with the same power as the 200 needle derma roller, the needles don’t penetrate to the proper depth. So it must be pressed stronger, approximately two times stronger according to the number of needles. Needles are a little bit thiner therefore it’s not needed to press 2,5 times stronger. If 540 needles penetrate to the proper depth, they cause similar or stronger pain than 200 needles. Microneedle technology was invented by Dr. Orentreich in 1995. In 1998 Dr. Desmond Fernandes presented a stamp-like, needle tool that ingested collagen in the skin and was used for general aesthetic treatments. In 2000-ben the German Derma roller S.a.r.l presented the Mesoroller series, after that the microneedle roller started to spread and became known. In 2004-ben the Clinical resolution laboratory presented the MTS Roller. As it became more and more popular, more and more firms developed their own derma roller with different designs. There are derma rollers with exchangeable head, with vibrating head, and needle stamp roller similar to the original one. Needle roller is the most suitable for the treatment as it enables us to pierce the skin at well-definied distance. This statement is proved by the fact that these tools are used worldwide.